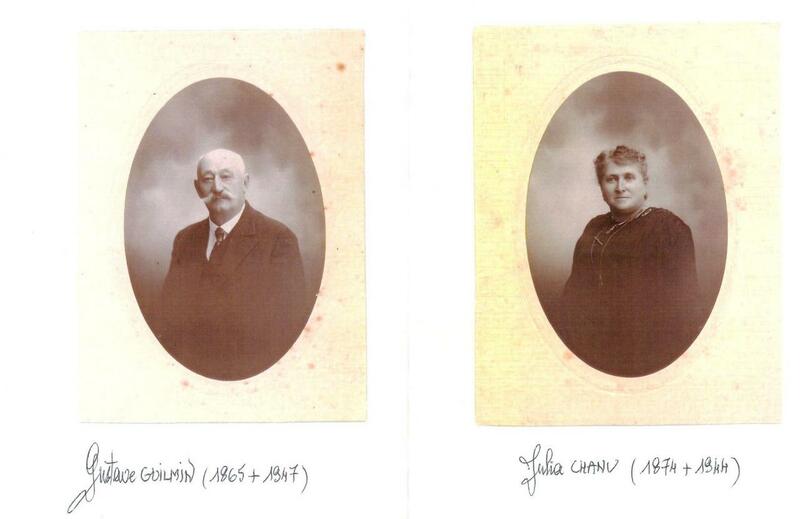 GUSTAVE EUGÈNE GUILMIN EST NÉ À BAZOCHES AU HOULME DANS L' ORNE, LE 05 MARS 1865, DE ARISTIDE GUILMIN (1833-1896) ET DE ERNESTINE GUÉRIN (1829-1902). VERS 1870, LE COUPLE GUILMIN, DÉCIDE DE DÉMÉNAGER ET DE S' INSTALLER À MONTSECRET PRÈS DE LA GARE, ATTIRÉ PAR LES OPPORTUNITÉS OFFERTES PAR LA CONSTRUCTION DE LA LIGNE DE CHEMIN DE FER PARIS-GRANVILLE . À LA MORT DE SON PÈRE EN 1896,GUSTAVE DIRIGERA L'AUBERGE FAMILIALE,QUI AVAIT PRIS ENTRE-TEMPS, UN CERTAIN ESSOR GRÂCE AU TRAFIC DE LA GARE TOUTE PROCHE. LE 10 FEVRIER 1897, IL VA ÉPOUSER MLLE JULIA CHANU, À SAINT-PIERRE-D'ENTREMONT. GUSTAVE GUILMIN ÉTAIT UN ENTREPRENEUR ET UN NÉGOCIANT DYNAMIQUE, IL PARLAIT BIEN ET FACILEMENT, SELON LES TÉMOIGNAGES DE SES PROCHES, ET IL ÉTAIT SURTOUT SECONDÉ PAR UNE ÉPOUSE CULTIVÉE,CAPABLE, ET GRANDE TRAVAILLEUSE. LA FROMAGERIE DE CAHAGNES : AVANT 1910, MONSIEUR GUILMIN ÉTAIT DÉJÀ LOCATAIRE DE QUELQUES CHAMPS DU VILLAGE VOISIN DE CAHAGNES, IL ACHÈTERA LA FERME DÈS QUE CELLE-CI SERA MISE EN VENTE, AVEC L'IDÉE D'Y CRÉER UNE FROMAGERIE. ON IGNORE LA DATE DU DÉBUT D'ACTIVITÉ, MAIS UN JOURNAL LOCAL NOUS INFORME QUE LE 30 JUILLET 1911 « UN DÉLIT DE PÊCHE POUR RAFLE DE TRUITES A EU LIEU DANS LE BIEF DE L'USINE À FROMAGES, EXPLOITÉE PAR LES ÉPOUX GUILMIN À CAHAGNES » . 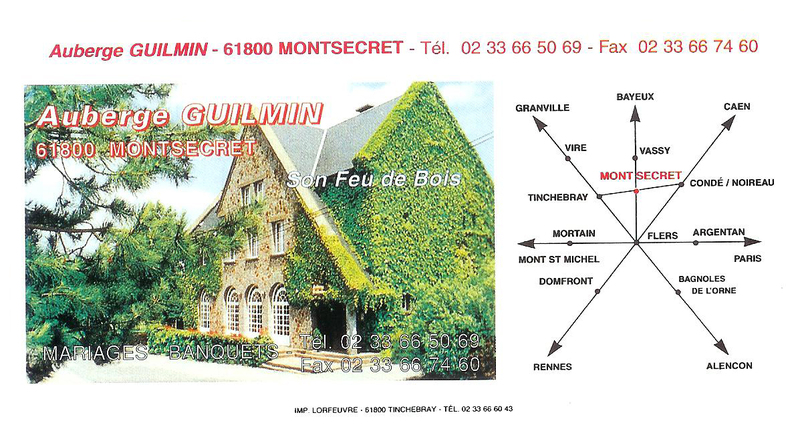 SELON LA FAMILLE, LA BELLE-MÈRE DE MONSIEUR GUILMIN, NÉE LEPETIT, SERAIT PROBABLEMENT À L'ORIGINE DE L'IDÉE D'UNE FROMAGERIE, ET C'EST ELLE QUI AURAIT TRANSMIS LE SAVOIR-FAIRE DE LA FABRICATION À SA FILLE. « LA CROIX DE FLERS » DU 04 AÔUT 1912 : « ÉCLATANT SUCCÈS. 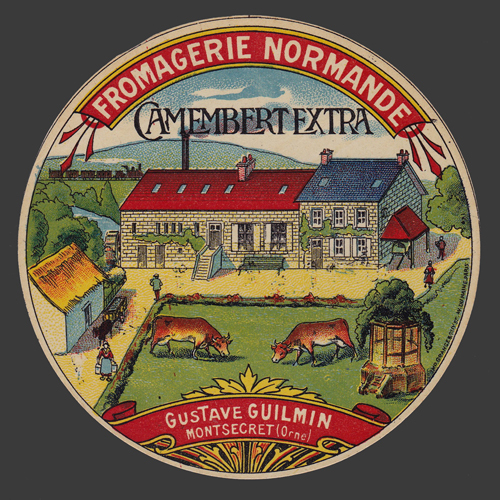 MR GUSTAVE GUILMIN, PROPRIÉTAIRE DE LA FROMAGERIE NORMANDE DE MONTSECRET, VIENT DE REMPORTER À L'EXPOSITION INTERNATIONALE DE BARCELONE, SECTION DES PRODUITS ALIMENTAIRES, UN DIPLÔME D'HONNEUR AVEC CROIX ET MÉDAILLE D'OR. NOS CHALEUREUSES FÉLICITATIONS ». 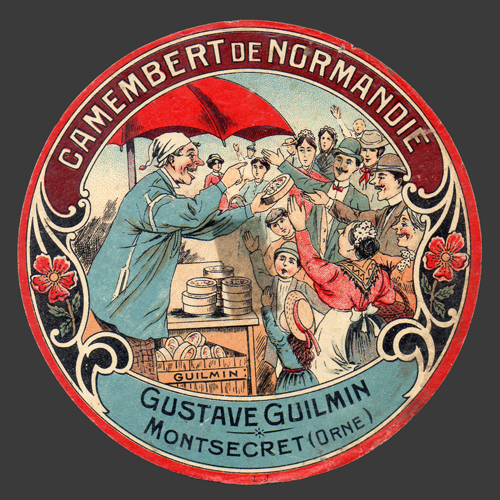 « COMICE AGRICOLE DE TINCHEBRAY » DU 17 AÔUT 1913 : CONCOURS DE FROMAGES 1er PRIX : MR GUSTAVE GUILMIN, DE MONTSECRET". 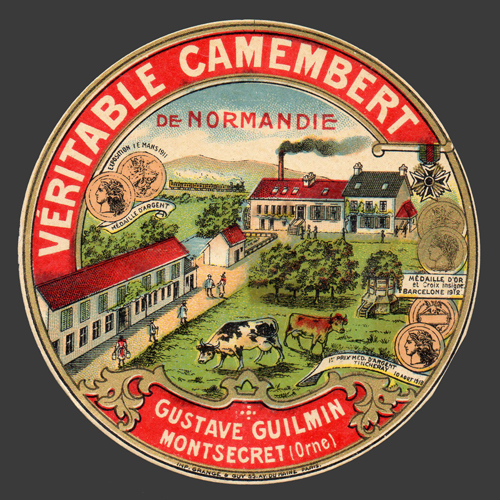 DU 01 MARS 1914 « AU CONCOURS GÉNÉRAL DE PARIS : MR GUILMIN DE MONTSECRET,OBTIENT UNE MÉDAILLE DE BRONZE POUR SES FROMAGES CAMEMBERT ». 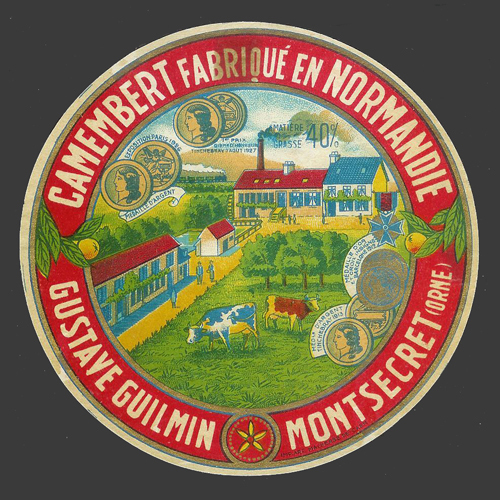 LA FAMILLE GUILMIN TRANSFORMAIT LE LAIT DE LA FERME, MAIS ELLE ACHETAIT AUSSI DU LAIT CHEZ LES CULTIVATEURS DES ALENTOURS. TRICHER AVEC LE LAIT : DANS LE JOURNAL DE LA CROIX DE FLERS, ON TROUVE A LA DATE DU 27 JUIN 1920,UN ARTICLE SUR UNE PLAINTE PORTÉE AU TRIBUNAL CORRECTIONNEL DE DOMFRONT PAR GUSTAVE GUILMIN, FROMAGER À MONTSECRET. CELUI-CI A FAIT SURPRENDRE EN FLAGRANT DELIT : UNE VEUVE FERMIERE DE FRÈNES (ORNE) QUI LUI FOURNIT DU LAIT « BAPTISÉ » D'EAU À 73 POUR CENT. (À CE TAUX LÀ,ON COMPREND QU'IL S'EN SOIT APERÇU). 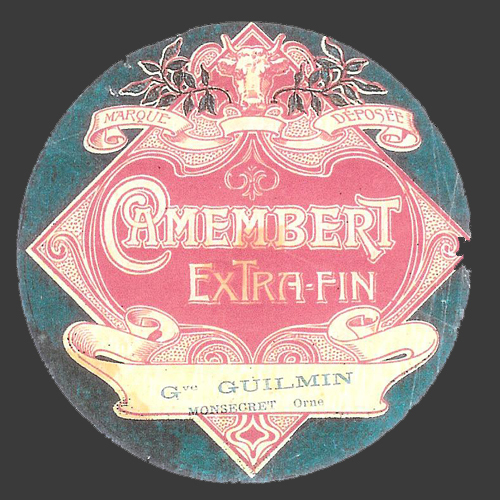 LES PRODUITS : LES ÉPOUX GUILMIN FABRIQUAIENT ESSENTIELLEMENT DU CAMEMBERT. MAIS SELON GÉRARD GUILMIN, LE PETIT FILS, ILS VENDAIENT AUSSI UNE CRÈME FRAICHE ÉPAISSE EN PETITS POTS, AVEC UNE INSCRIPTION : « LA CRÈME GUSTAVE ». CE PRODUIT ÉTAIT VENDU PRINCIPALEMENT SUR PARIS. LES EMPLOYÉS DE LA FROMAGERIE : À LA FROMAGERIE GUILMIN TRAVAILLAIT MLLE CONSTANCE DUPONT. ELLE S'OCCUPAIT DE LA TRAITE DES VACHES ; LE 29 JUILLET 1917, ELLE EST CITÉE DANS LE JOURNAL POUR « UNE RÉCOMPENSE AGRICOLE DE 10 FRANCS,COMME EMPLOYÉE À LA FROMAGERIE GUILMIN DE MONTSECRET » ELLE EST DECÉDÉE CÉLIBATAIRE VERS 1975, À L'ÂGE DE 85 ANS ENVIRON. EN 1921,ON TROUVE DEUX NOMS : JULES PELLUET ET HENRY LOURY. VERS 1920, ENTRE À LA FROMAGERIE DE MONTSECRET UN PETIT COMMIS QUI S'APPELAIT HENRY VALLÉE. 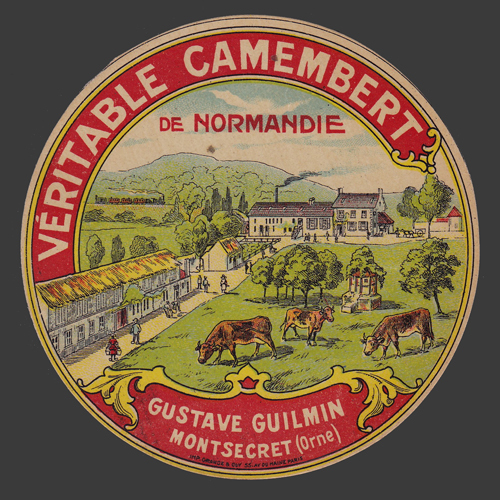 C'EST LÀ QU'IL VA APPRENDRE À FABRIQUER DU CAMEMBERT, AVANT DE CRÉER SA PROPRE ENTREPRISE DANS LES ANNÉES 1930, À LA FERME DU GRAND BERON, À CLÉCY, DANS LE CALVADOS, AVEC LE SUCCÉS QUE L'ON SAIT. Par Serge Schéhadé avec l'aide précieuse de Monsieur Gérard Villeroy. Historique écrit en septembre 2003. Reproduction totale ou partielle interdite sans autorisation préalable de notre part.